We left our home base of Calgary on the Saturday morning of our trip and stopped in the mountain town of Canmore, an hour away. 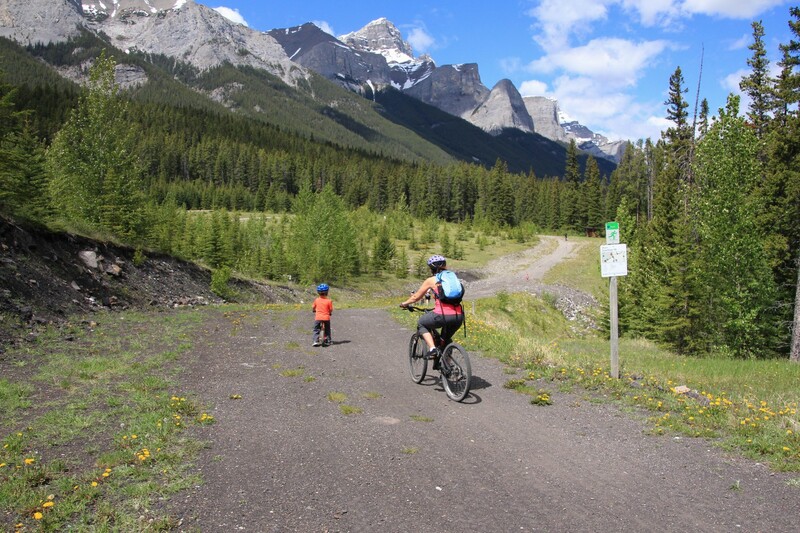 Located approximately 1.5 hours from the Lodge, it was the perfect half way point to stop and explore the bike trails at the Canmore Nordic Centre. I’d long been curious about the Nordic Centre in summer after spending many a happy day skiing there in winter. I was further enticed by the lack of trail fees in summer which is always a bonus when visiting a professional training center complete with mountain bike skills park, maintained trails for all levels, and even a paved trail for roller skiing. We found the paved trail to be a great starting point until we were ready to launch off onto some more natural trails en route to a beautiful meadow, and our picnic destination. We only spent a few hours at the Nordic Centre but we were on a mission to get to Mount Engadine Lodge in time for afternoon tea and still had the next section of our drive ahead of us. The lodge was everything we remembered it to be and we were given a family suite in a private cabin to raise the bar for future expectations when we visit Mount Engadine Lodge. It was an incredible place to spend the night as a family with our own space to retreat to when we wanted down time away from the other guests, and an easy way to put our son to bed early while we returned to the main lodge to visit with the other patrons. We feasted on salmon wrapped in puff pastry, ate way too much coffee cake and chocolate mousse, and woke up Sunday morning to a scrumptious breakfast buffet laid out for us. I am pretty sure I will never tire of staying at this lodge and that the experience could never grow old! In future trips we will come back to try the local hiking trails in summer, try skiing in winter, or even repeat the same snowshoe and bike trails. After making our lunches for the day and packing our bags for the return trip home we headed over to the nearby Mt. Shark day use area and trailhead for the trip’s main focus – more mountain biking! Located only 5 min. away from the lodge, access to Mt. Shark could easily be made on bike if you were staying at the lodge for a few days and wanted to park your car during the duration of your stay. Our destination for the day was Watridge Lake via the maintained Watridge Lake ski and bike trail. We had been told that it would be a good destination for a family trip and for an adult who’s extremely green at mountain biking to say the least! I had rented a bike for the weekend from the Canmore Nordic Centre and hoped it would perform well on the rocky trail. As it turned out, I had nothing to fear and I now want to purchase my own mountain bike for future trips. Our son was on a Strider Balance Bike and managed to bike the entire 4.5 mile return trip to the lake and back as well as make it further on foot with us up to Karst Spring. The spring was a neat sight with water flowing straight out of a hole in the ground before it plummeted off a cliff in a spectacular waterfall. We were glad we pushed on to see it, even if it did add a mile to our trip distance. We had a fabulous day biking at Mt. Shark and are definitely going to return next year for a biking/camping weekend with other families. We’ll revisit the Nordic Centre too and hopefully I’ll have my own mountain bike by then. Our son will be on his own pedal bike by next year too which will be exciting as we fully launch into becoming a mountain biking family. 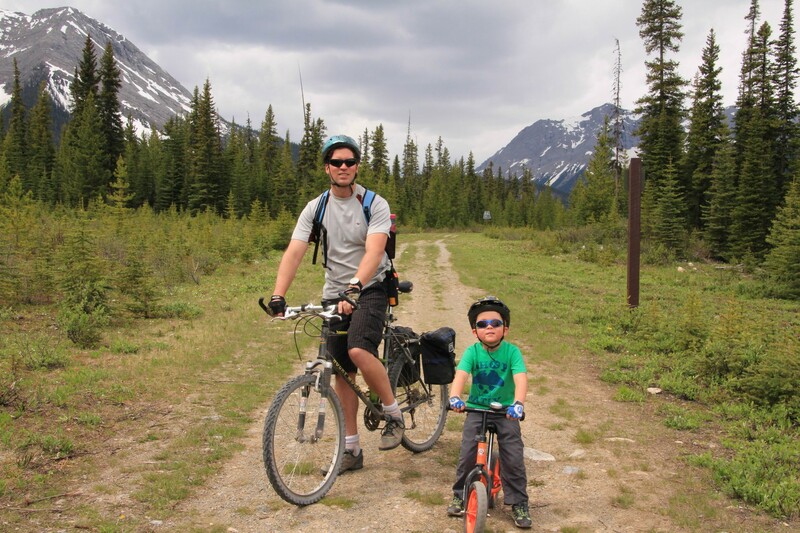 Planning your own summer trip to Kananaskis? 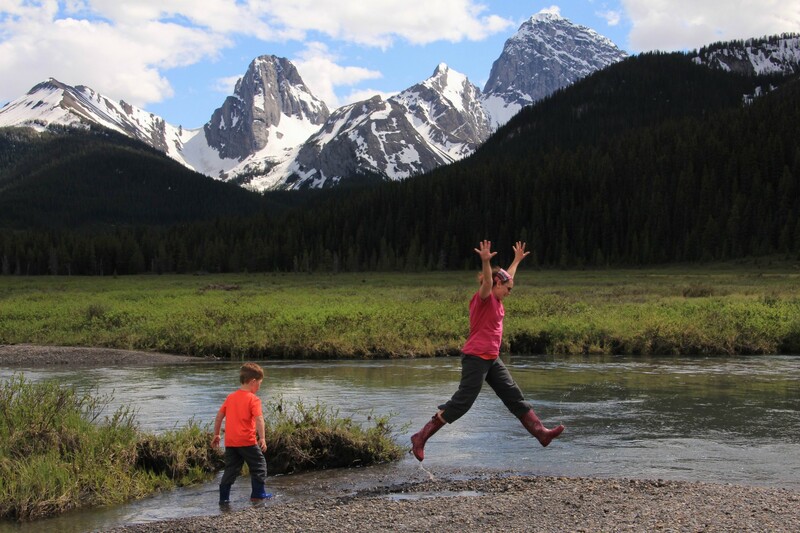 While the area was recently hit by serious flooding in late June, the Canmore Nordic Centre and Mt. 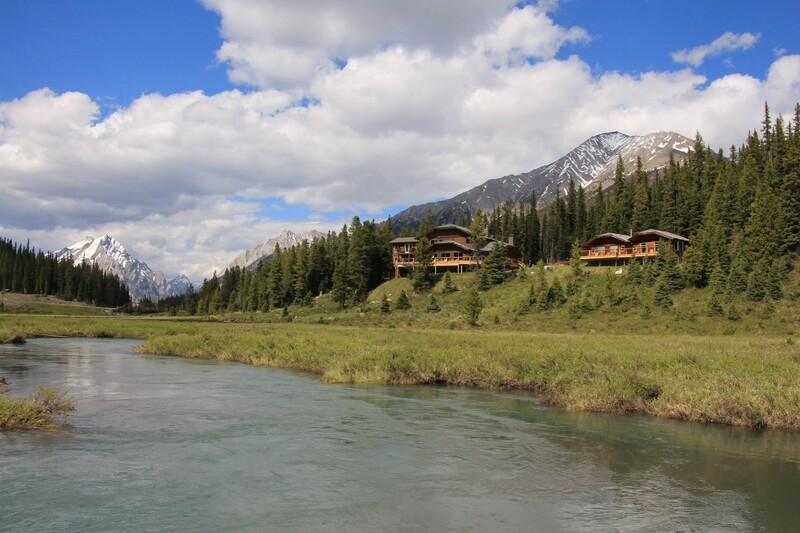 Shark trailhead have reopened, and Mount Engadine Lodge opened its doors again a few weeks ago. 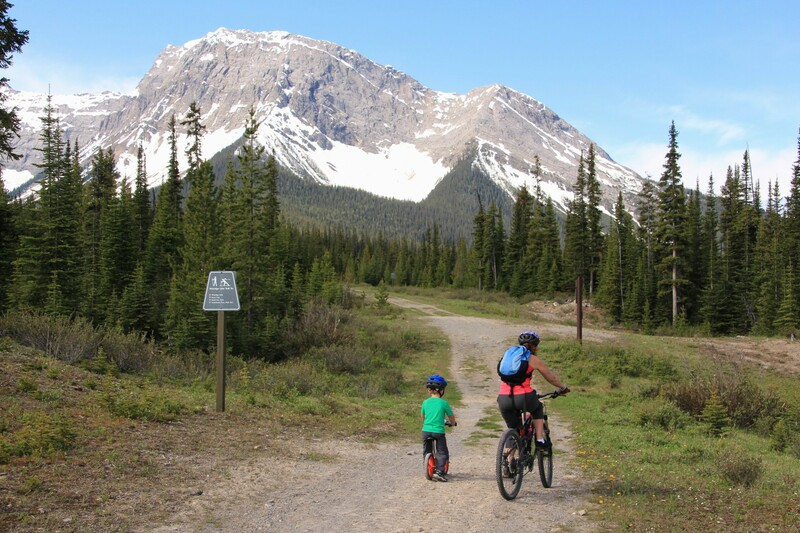 To follow updates as roads and trails reopen, visit the Alberta Parks Website. 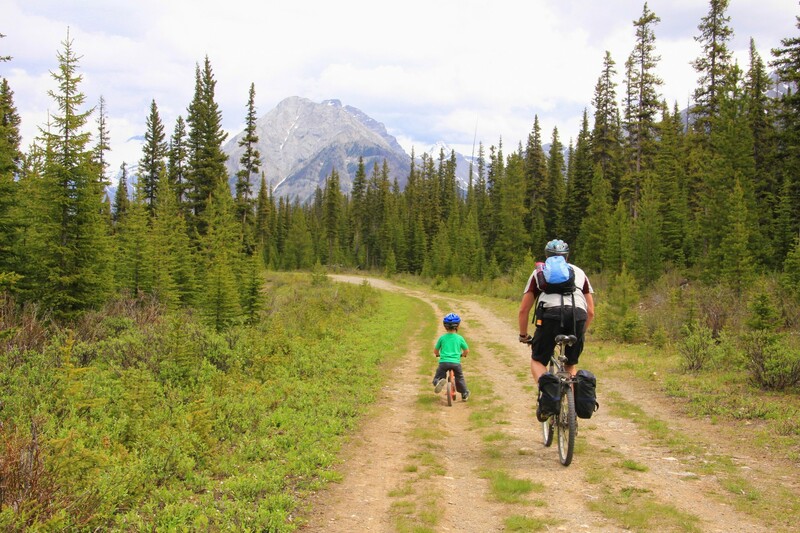 Also of interest in the area is nearby Peter Lougheed Provincial Park with opportunities for camping, biking on both paved and natural trails, paddling, hiking, and backpacking. Most of the campgrounds have opened again following the June flood and trails are slowly coming back to life as well. 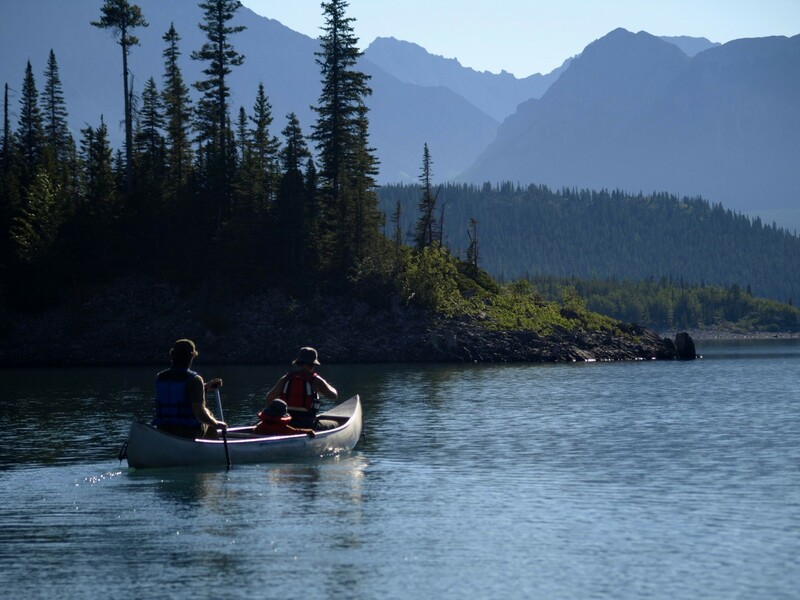 Guaranteed, you can paddle on the pristine Upper and Lower Lakes for an experience that you won’t soon forget if you rent a canoe or kayak at Kananaskis Village on your way through the area. Kananaskis is my playground and I enjoy discovering every corner of it whether on snowshoes in winter or on bike in the summer. Add some paddling, camping, or skiing to your trip and you could stay for a month without ever getting bored. It is the hidden gem of the Canadian Rockies and always my pleasure to share with you.